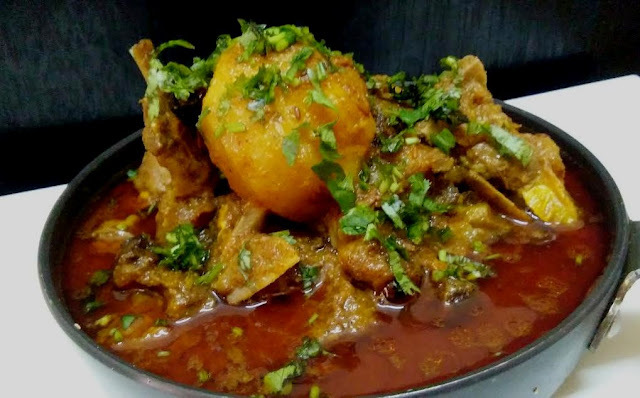 Potato Mutton Masala is the recipe of mutton made in the native manner, which is made with spices, oil, ginger, garlic paste and onion paste, and then fried onion added to potatoes and cooked as usual. This recipe does not require tomatoes, yogurt or any additional ingredients. It is served with rice or chapati (as well as Algae) and onion lemon salad. As it is cooked on low flame its taste is enhanced. You can also prepare it for any party, along with tawa bread or tandoori bread can be served. small size potato 4 nos. Wash the mutton then put it in a pressure cooker. Add salt, red chili powder, turmeric powder, coriander powder, ginger-garlic paste, cinnamon, clove, mace, black cardamom, green cardamom, cumin seeds and oil. Stir and mix all the ingredients together. 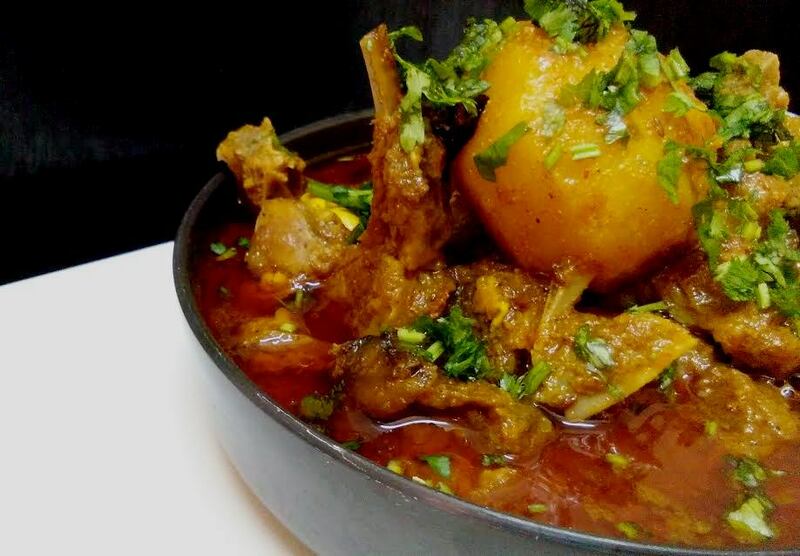 Simmer the heat cover and cook the mutton for 20 minutes, stir occasionally. peel wash and prick with fork the potato. Heat ghee in a pan and fry the sliced onion till golden. Keep aside. Now open the lid and add potato, fried onion and kashmiri red chili powder. Mix well and stir continuously. Cook for 5 minutes then add 1/1 /2 glass water and cook for 10 minutes on medium heat. Switch off the gas, Garnish with coriander leaves and serve hot with chapati, rice or parantha.